Stories featuring student/teacher relationships can be taboo, but when handled correctly can lead to a satisfying read. Georgina Guthrie's The Weight of Words is such a book. Aubrey is almost done with her undergraduate degree and works for the Dean part-time. When she meets the Dean's son, Daniel, the teaching assistant to the professor of her Shakespearean class, they begin to bond over a shared love of the famous author. Both characters are well-defined, highly likable, Aubrey has a wonderful sense of humor and Daniel is a great guy, even with the mark on his record. Things happen to keep them apart, but readers know when destiny is involved, couples will find their way to each other. 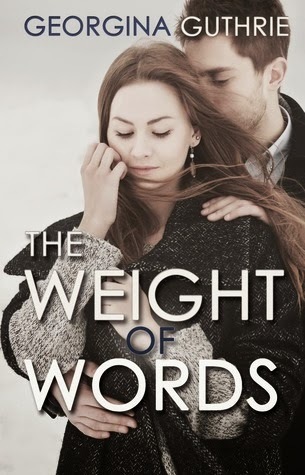 The Weight of Words is a New Adult contemporary romance filled with literary treasures, a couple to fully support and fall in love with, and is an absolute gem of a read. Refreshingly different, a tad predictable but still tense enough, sit back and let the magic of the words enchant you. This photo may seem like a simple one with a posed couple. For me, this cover works. There's something about it which draws me to it and I really like it.